Cars line up to pick up students outside Oshkosh North High School on a recent summer school day. 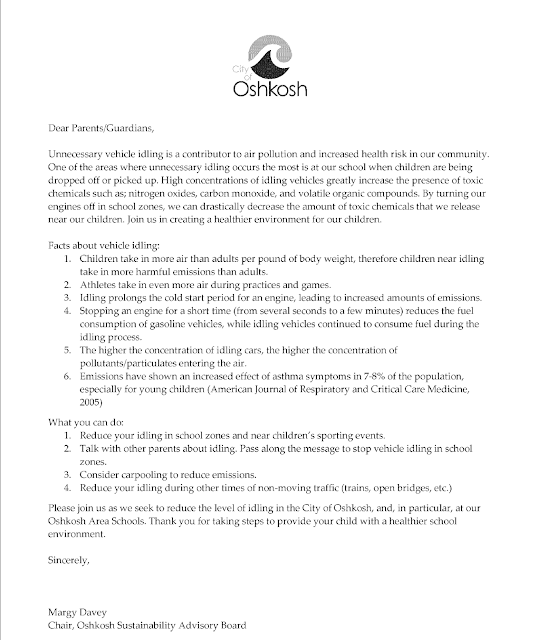 A letter warning parents and guardians of the environmental and health risks of vehicle idling has been approved by the Oshkosh Sustainability Advisory Board to be sent to families throughout the school district. Rachel Williams, a parent picking up her son recently from a summer class at Oshkosh North High School, saw the letter and immediately turned off her car. “I took a picture of [the letter], so I was going to share it on Facebook,” Williams said. The letter (shown below) asks parents to reduce idling in school zones and near children’s sporting events to prevent children from taking in the harmful emissions that come from vehicle idling. The letter is just a warning to parents, and there will be no legal consequences if someone is caught idling their car in a school zone. In other municipalities that have passed vehicle idling laws a temperature restriction is also attached, which makes the law invalid when the temperature is above 85 degrees or below 40. “The hope is that parents realize all of the health issues that arise from vehicle idling and that they then stop idling their vehicles in school zones, especially in peak times of picking up and dropping off kids,” said Vic Oliver, Oshkosh Sustainability Board member and author of the letter. “And then during sporting events as well because athletes take in significantly more oxygen than kids who are not being athletic, so therefore their intake of CO2and other harmful chemicals has almost doubled,” she added. The letter will be included in a welcome packet that parents will receive when enrolling their children this upcoming school year. If you click through to the website https://iturnitoff.com/school.html there is a poster and other tools to help spread the word. Idling cars aren't just bad for people; they're bad for the environment since they produce carbon dioxide, a primary contributor to climate change. So it's a great idea to turn off your vehicle when you're stopped for a train, too.